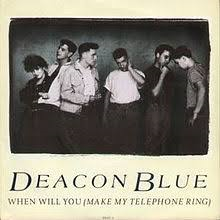 Deacon Blue were never a band that could be called cool. And in 1988, for a long haired, denim wearing, heavy metal listening 16 year old they certainly were not on my listening radar through choice. For sure the songs they released became locked into the psyche as they got extensive radio play on both the BBC and commercial stations. But Raintown, the debut album from Ricky Ross and the band, wasn’t one I was going to buy. However as time goes on, and as tastes develop, my appreciation of this Scottish band has grown. On the couple of occasions I’ve seen them perform live they’ve been brilliant; tight, full of energy and musically fabulous. And always one of the highlights has been the single that got its second, and successful, release this week 30 years ago, When Will You (Make My Telephone Ring). Not as well known as lead single such as Dignity, nevertheless this song is one that shows off the quality and talents of the band. When asked about the song Ricky Ross is quoted as saying ‘the song is about waiting to be discovered, spurred on by the unrequited love of an ex-girlfriend’ (Interview in the Daily Record 2012). Featuring backing vocals from the group London Beat, the single reached number 34 at its peak, a criminally low position for what I think is their best song. I utterly love this track and Raintown is my album of all time. It just takes me there every time!